Robert (Bob) Sheppard, Head of the Sub-Division of Peptide Chemistry, in the LMB’s PNAC Division for over 20 years and internationally recognised in the field of peptide synthesis, died on Tuesday 15th January 2019. Bob was born on 27th May 1932. He received a BA in Natural Sciences (Class I) from the University of Cambridge and then a PhD on the ‘Studies in the degradation of peptides’ in 1957. He became a Postdoctoral Research Fellow of the Salters’ Company and then spent a year at Harvard University under the direction of Professor R. B. Woodward. In 1958, he became a Lecturer, then Senior Lecturer, and Tutor, in the Department of Organic Chemistry, Liverpool University. In 1971, he was recruited to the LMB by Max Perutz to set up and head a new Sub-Division of Peptide Chemistry. The aim was to research and develop new methods for the partial and total synthesis of peptides and proteins. The group quickly expanded and Bob was joined in 1972 by Eric Atherton and Doug Dykes, and a continuous flow of young chemists passed through the group over the years. One of Bob’s most outstanding achievements was the development of a new and revolutionary method for solid phase peptide synthesis based on the original Merrifield concept. This was achieved by detailed studies to optimise the assembly of such polar biomolecules, particularly through the development of a series of novel solid supports based on polydimethylacrylamide. Considerably higher yields were achieved as well as greater reliability compared to all previous peptide synthesis methods. Applying the same solid support concept to oligonucleotides, also Bob’s revolutionary idea, he entrusted for development to LMB’s Mike Gait. Success here was instrumental in many applications of oligonucleotides in molecular biology and later molecular medicine. Bob’s second world-beating development for solid peptide phase was the use of the novel protecting group, fluorenylmethoxycarbonyl (Fmoc), first proposed by others, that is still used to this day in the majority of standard automated peptide synthesisers. In particular, he pioneered the use of continuous flow peptide synthesis and designed and built machines suitable for this purpose. Through the use of novel solid supports and protecting groups as well as machine technology, Bob became internationally recognised for many years as the world leader in the field of automated solid peptide synthesis. Bob’s unified approach to peptide synthesis led to the higher quality peptides that could be used for structural, biological and therapeutic studies. The methods formed the basis for the success of a local company, Cambridge Research Biochemicals (CRB). In recognition of this, the LMB and CRB jointly received the Queen’s Award for Technological Achievement 1989. Bob officially retired in April 1991, having been leader of the very successful peptide synthesis group for 20 years. He continued to act as a consultant to the Peptide Group until 1993, and was a strong supporter of the LMB, continuing to visit and attend events until fairly recently. In 1985, Bob was made a Liveryman of the Salters’ Company and Freeman of the City of London. Mike Gait commented: ‘Bob’s brilliance as an innovating peptide chemist never perhaps quite achieved the world fame that it should have done but in my opinion he should be regarded as one of the best of his era in this field. I am proud and exceptionally grateful to have been mentored at LMB by Bob and provided with the opportunity to take his pioneering concepts to fruition in the oligonucleotide field‘. Richard Henderson, former Director of the LMB, commented, ‘Bob was a great member of the LMB for many years and led the expansion into the broader chemistry research domain. 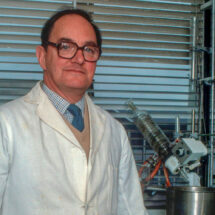 He was also a kind and generous man, very much in the science-led LMB tradition’.